Even the best amplifiers in the world (and ours is not) can be susceptible to electromagnetic noise. You've got your killer experiment designed, your preparation and electrode in place, but BLAST! where is that infernal noise coming from that's drowning out your spikes? You can thank Nikola Tesla for your electrical noise, but, have no fear, Michael Faraday has come to your rescue! In the lesson you will learn exactly what makes electromagnetic interference (EMIs) and how they interfere with your recordings. You will also learn how a faraday cage helps shield your recordings from (EMIs). Finally you will build your very own faraday cage and enlist in the battle against noisy data! A Faraday cage is a container made of conducting material, such as wire mesh or metal plates, that shields what it encloses from external electric fields. 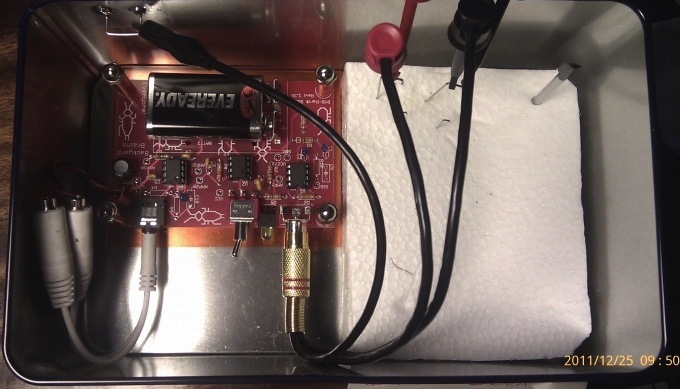 In our experiments, a Faraday cage can be used to prevent external electromagnetic interference (EMI, or noise) from interfering with our neural recordings. As you know, the neural signals that we are recording are very small (on the order of micro-volts), and we use our Spikerboxes to amplify these small signals to a large enough amplitude that we can hear and record them. Depending on our environment, though, there can be electromagnetic, radio, microwave, or other types of invisible emissions that can travel through the air and interact with the metal needles and wire that we use as electrodes. The metal then propagates the noise signal like an antenna into our neural recordings, interfering with or even drowning out our recordings so that all we hear, in the worst cases, is a radio station! A Faraday cage then can be used to block many of these noise sources. Where ε0 is the permittivity of free space and er is the radial unit vector. If you don't understand the math (you will one day), it means the electric field strength declines the further away you are from an electric source. If you are driving on a highway and notice a radio station fading, for example, it's because you are getting further away from the big radio transmitter tower. Coulomb's Law demands that the charges in a conductor at equilibrium be as far apart as possible, and thus the net electric charge of a conductor resides entirely on its surface. Any net electric field inside the conductor would cause charge to move since it is abundant and mobile, but equilibrium demands that the net force within the conductor is equal to zero. Thus, the electric field inside of the conductor is zero. Rule 2 tells us that the electric field inside the conductor at equilibrium is zero, and Rule 1 tells us that the charge of the conductor will be found entirely at the surface (boundary). 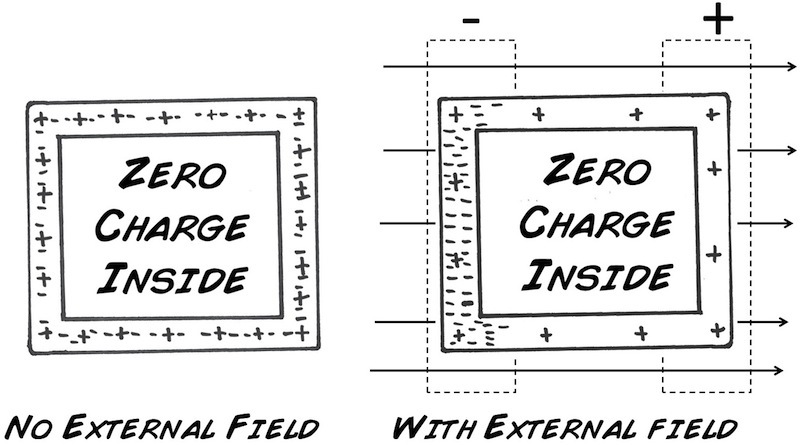 In other words, the surface of the conducting volume becomes a barrier where charges move to and around the surface to generate fields exactly opposing any charge that seeks to cross the border, thus maintaining an interior free from external electrical interference. Faraday first demonstrated this in a famous ice bucket and metal sphere experiment. Faraday lowered a metal ball charged with static electricity into a metal bucket supported by a wooden chair that insulated the bucket from the ground. When the charged ball was lowered into the bucket without touching the bucket, the charges on the surface of the bucket became redistributed through electrostatic induction. This concept became known as the Faraday cage principle you are studying today. Below we will examine the effects of the Faraday cage on various conditions when doing neural recordings with the SpikerBox, along with an easy experiment you can do at home. Here is a video explaining a very simple way to build and use a Faraday Cage. Note that we also sell pre-made Faraday Cages if you do not want to visit the hardware store. Staple first strip at end of mesh. Create a noisy environment by hooking up a laptop to wall outlet and turning on a soldering iron or other high power appliance. Place your SpikerBox by these electronics, and also turn on all fluorescent lights in the room. Record your observations on noise level vs. neural signal level. Clip an alligator clip to the ground (outside of RCA connector) on the Spikerbox. Place your Spikerbox into your Faraday cage, with cage open. Record your observations on noise level vs. neural signal level. Microwave ovens are examples of Faraday cages, because they are meant to prevent the radiation used to cook the food from escaping into the environment. Aluminum foil is a conductive material, which may also be used to create a quick, impromptu Faraday cage (just ask your neighborhood neuroscientist). Call your cell phone and make sure that it rings (this is your control). Next, take your cell phone and put it in a (turned off!) microwave. Call the cell phone from another phone. Does it ring? Next, open the microwave door and dial your house phone number on the cell phone. As soon as you hit 'send', shut the microwave door quickly. Does your house phone ring? Finally, wrap the cell phone in aluminum foil. Call the cell phone again? Does it ring? What do you think a Faraday cage would do to an electromagnetic signal that comes from within the cage? Would someone outside of the Faraday Cage be able to receive that signal? Where would be the perfect place to do a recording? What do you think would happen if you used large hole chicken wire instead of small hole screen metal mesh for your Faraday Cage? Why do you think cell phone noise still interferes with the SpikerBox even though the holes in our Faraday Cage are smaller than the 1.4 cm we calculated? One can also use an old metal box after eating all the cookies from it. Instead of a using double alligator cable to clip the reference to your Faraday cage, you can make your probe cable consist of three wires. Two usual electrodes (reference + recording electrode) + one extra reference with alligator clip that you connect to the metal cookie box.